A diving course is the start of a lifelong adventure! Everyone with normal health can learn to dive. Diving is fun and relaxing as it’s on the same time is exiting and thrilling. 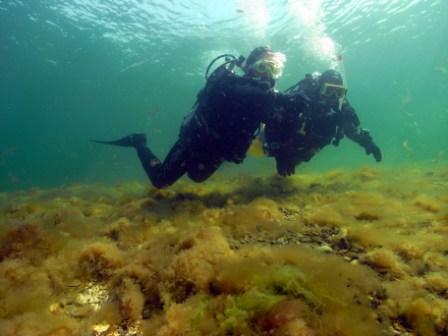 H2O in Lund offers PADI courses at all levels from beginner level to Instructor level courses. We also offer technical dive courses for example DSAT Tec deep. At H2O in Lund we will help you to become a self-sufficient and safe diver, we therefore include two days of extra diving upon finishing the new beginner diving course – Open Water Diver. We believe that those extra supervised diving gives you a lot of additional comfort and experience. After successfully completing the entry-level course, you’ll receive a PADI Open Water Diver certificate, the world’s most widely recognized diving certificate. This entitles you to rent equipment and participate in dive excursions all over the world. If you want to continue your dive education we offer may special courses such as deep diver, wreck diver and underwater photographer, as a PADI Five star IDC center we also leadership and instructor courses.